Root canal treatment (also called Endodontics) is needed when the pulp inside your tooth becomes infected through tooth decay or damaged by an injury to your mouth. This infection may spread through the root canal system, which could eventually lead to an abscess, causing a great deal of discomfort. If root canal treatment is not carried out, the tooth may need to be taken out. Our dentists can perform root canal treatment to stop the infection from spreading and will preserve as much of your tooth as possible. Using specific techniques and advanced equipment, you will receive a local anaesthetic and the treatment overall should feel no different to having an ordinary filling placed. The aim of the treatment is to remove all infection from the root canal. The root is then cleaned and filled to prevent any further infection. A temporary filling is put in and the tooth is left to settle. The tooth is checked at a later visit and when all the infection has cleared, the tooth is permanently filled. Root canal treatment is a skilled and time-consuming procedure and most courses of treatment will involve two or more visits. To keep your mouth in tip top shape we recommend you come in for regular hygiene appointments and dental check-ups. After my son had cracked a tooth Garden View responded to my query immediately and saw my son first thing the next morning. The service couldn't have been better - thank you! 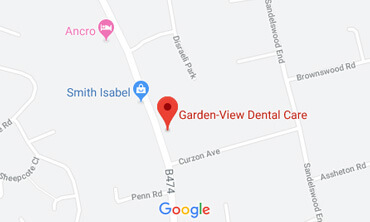 Garden View Dental Care Reviewed by Alan on I switched dentists about a month ago, purely because I felt I was being overcharged (in a very nice way) by a dental practice which had looked after me for thirty years. Their prices were going through the roof --- and not the roof of my mouth. Dr Makhani and his superb team of people have been a revelation! Charming, courteous, technically brilliant. He explained every single step he was taking in fitting a Maryland bridge and everything went swimmingly. Not only that, the price was eminently reasonable --- much, much less than I would have paid with my former practitioner. It's reassuring to know that (despite what my current wife says), even at my extremely advanced age, I can still get some things right! Moving to Garden View was a very good decision, even though I say it myself. Out of hours for additional charge. If you have an emergency, please call us as soon as possible and we will endeavour to see you the same day.